The Skinny: Better than expected, though that really doesn't mean much. 2R fans are probably sold, but everyone else should have better things to do. Don't let the crappy knockoff English title fool you - The China's Next Top Princess is not a comedy. It does possess its funny parts, but it's more of a drama than a comedy. Sadly, that drama is of the ultra-light, afterschool special variety, which is odd given the fact that the film is more Dallas-in-the-Palace than a costume version of Beverly Hills 90210. To use Chinese references, The China's Next Top Princess is like a watered down cross between Lover of the Last Empress and Raise the Red Lantern. It's also much crappier, and doesn't feature Gong Li or even her modern knockoff Zhang Ziyi. But fans of the Hong Kong edition of Maxim Magazine needn't fret: this movie has 2R. 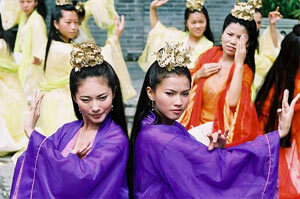 Pearl (Race Wong) and Yuen-Yang (Rosanne Wong) are two wannabe princesses who answer an Imperial edict to report to the palace and take part in a princess competition. Basically, the winner gets to be a new court lady and bedmate for the Emperor (Edwin Siu). The losers become servants at the palace, and must wait upon their competitor until the end of time. Luckily, the two girls came from the same village, so they become instant pals. Sadly, that friendship is threatened with destruction by the winner-takes-all competition between the potential princesses. Their main competitors include your standard types, including bitchy rich girl Isabel Chan, who will engage in chicanery to better her chances. But there's an even tougher, more dangerous player here: Pearl. Once Pearl catches on to the (dirty) rules of the game, not even Yuen-Yang may be safe from her scheming. If you choose not to see this movie, nobody will ever blame you for it. While better than one might expect, The China's Next Top Princess is still too lightweight to register as a serious film - which is weird, because the subject matter is ripe for your expected commentary about femme vs. femme scheming in Ancient Chinese society. Specifically, this tale of corrupt cute girls could have meant more than two sisters playing strangers-turned-friends who let some dopey Emperor get in the way of their magical friendship. Sadly, the film doesn't accomplish more than that, and seems content to go about its could-be sordid tale in a light and blithely charming fashion. The result can be mindlessly pleasing, like flipping through an issue of Yes! and looking at the pictures. The girls are largely cute, and Race Wong continues her streak of capable, better-than-average acting jobs in movies that nobody ever sees. Rosanne Wong is fetching as the pure-hearted one of the pair, and puts on a knees-weakening shy girl act that's a fine counterpoint to her tougher-seeming - and arguably more attractive - sister. We're easy to please over here.